My friend Suzie The Ebay Queen posted spring pictures on her blog today - just a little somethin' to get us over these last few winter days. Seemed like a great idea, so I'm posting a few of my own. The last of our snow melted today, and it's suppose to be in the 50's this weekend and maybe 60 by Monday, so maybe the photos are working. Last year's Swing Garden. 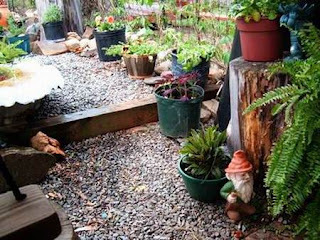 Don't look directly at the Gnome, it makes him nervous. 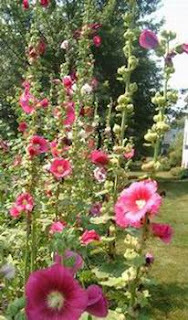 The Hollyhock Ladies...their specialty is bobbing and nodding. 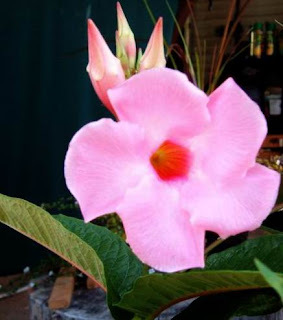 Pink Mandeville....a tropical plant who somehow found itself lost in southern Virginia. 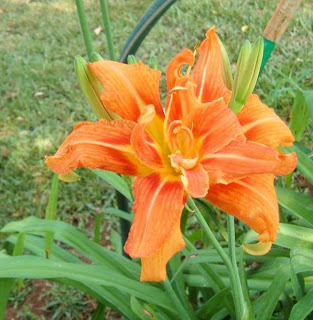 One of the 2005 daylilies.....one of the most perfect flowers....they never demand fertilizer, weeding or water......and they multiply without being asked to. Hang on -spring is almost here!